A Reflection: What’s Your Purpose? For me, hearing the sad news, and having only briefly met Max in April this year, I was saddened. I grew up listening to test cricket and watching test cricket and seeing Max Walker there. I followed his cricket career, and his post cricket career where he was a commentator of cricket, and was pleased to see that he made a very successful transition to the speaking circuit, where he shone. And if that’s the case, what do you want to be remembered for? In most cases, our infamy disappears with us. For most of us, nearly all of us, our legacy following our death diminishes greatly. Once the lid slams shut on your coffin and the velvet curtain draws closed, those left in the audience head off to devour cake and scones. I marvel at the number of new patients I see in dentistry who either cannot or choose not to remember the name of their previous dentist. I think it’s more the former. This is the name of someone who they trusted…and yet, they cannot recall their dentist’s name? This is someone who they were happy to write a cheque to? Someone whose name appeared on their credit card statement…. So, how do we become revered and remembered after we move on to the next life? Although Max Walker was the third of three fast bowlers in the Australian cricket team, playing second fiddle to the great Dennis Lillee and the great Jeff Thomson, he was never ever, the “other guy”. I believe though, that Max is, and will be remembered, probably more because of his accomplishments post-test cricket, than because he took 6 for 15 in 1973 to prevent Pakistan from winning a cricket test. When it comes to your eulogy, and beyond, and before for that matter, what do you want to be remembered for? What sort of legacy do you want to be known for? For some of us, our story disappears before we pass, and before we even retire..
Are you a Neville Nobody? Don’t just park yourself in one place of ignominity. It’s not difficult to exceed your patients’ expectations when they are down in the treatment rooms. After all, they’re feeling as though they are in a place that they absolutely do not want to be in. Most patients visiting a Dental Office would rather be somewhere else. So small deliberate efforts to improve the experience for the patient will elevate their opinion and appreciation of your business. 1. Have the room set up for your patient ahead of time. Nothing says, “We don’t care” more than not being prepared. Imagine arriving at a friend’s place for dinner you’ve been invited to and nothing’s even ready? You wouldn’t be “feeling the love”, would you? And really, at the dental surgery, you know what the patient is going to be having, and yet you haven’t got the decency to be ready for them ahead of time? Time and time again I see practices with patients in the chair and dental assistants running around for local anaesthetic, matrix bands, the Crown and Bridge Lab work…. the list goes on and on. Tell the patient you are ready for them with your non-verbal communications…. Have everything assembled in advance! 2. Stay with your patient. A patient should never ever ever be left unattended in a treatment room. Leaving a patient on their lonesome for whatever reason is no valid reason. Leaving a patient unattended is rude. It shows you are either unprepared or you don’t care. The patient is paying for your time, so spend time with them. Sit and visit and listen to their tales and stories. Ask engaging questions of your patient. Get to know your patient better. Try to extract some “Secret Service” information that you can share with your fellow workers that they can use when speaking with this patient on subsequent occasions. 3. Check in on your patient regularly during their treatment. Some dentists get so engrossed in what they are doing that they forget that there is a human being attached to the tooth that they are working upon, and that that human being has a mind, a heart, and feelings. Some dentists treat their patients like still life objects and reduce the appointment to a photo shoot for self-promotion at a later date. Other dentists simply get “caught up in the moment” and fail to check in. By pausing regularly, and placing a caring hand on your patient’s shoulder you can create a very strong bond with them. This simply reconnects with the patient and reassures them that we are indeed cognisant with their presence and their perceptions. I used to check in with my patients several times during a restorative appointment in this way, simply to let them know that I cared. It’s important to make those connections. At the completion of treatment, nothing connects better with the patient than having your Dental Assistant greet them with a warm towel when their dental chair arrives in the upright position. You’ll be amazed at how many patients actually look forward to this part of their appointment. It may be because they do not get to experience this sort of service very often, or it may be because they have become accustomed to this great service already following previous visits to your dental practice. All I know is that patients are drawn into a connection with your office and your team members as a result of these lovely warm towels. In the Ultimate Handover process I emphasise the importance of steps six to ten, which are emotional components of the handover as opposed to factual clinical components. All ten components of the Ultimate Handover process are vitally important. The last five steps go a long long way towards cementing that perfect connection between the Dentist and the patient. • Look the patient in the eye, and thank them sincerely for their time. • Compliment the patient on being such a great patient for you today. • Farewell the patient with sincere wishes of best wishes and good health. • Recognise or re-recognise any significant event coming up for the patient that will occur before their next visit. • Look to create any Above and Beyond Experiences for the patient. If the patient has mentioned something personal, the Dentist may have an opportunity to provide an article or small gift that may be appropriate in that situation. Don’t be seen to be in so much of a hurry that you miraculously vanish into thin air at the end of their appointment. Remember, they’ve been with you, in your company, for a reasonable period of time. Make the farewell genuine, like you would for a friend leaving your home following a pleasant dinner party. 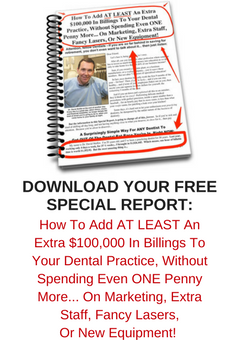 Do these five things consistently at every visit for every patient and your patients will definitely notice the difference and will tell their friends about how your Dental Practice is different from all others around. And they’ll tell their friends how your Dental Practice is so different it could teach a few other businesses about great customer service, and how things should be done. One of the things you need to have to run a successful business is outstanding leadership. It’s a quality required of business owners if they want to differentiate their business to stand out and be different. To stand out, not just amongst similar businesses, but to also stand out as being different amongst businesses in your local community as well. A well-led business is easy to identify. A clear vision of where the business is going and what that business is trying to achieve. Without a clear vision, the business has no true purpose, except to “get through” the day, each day. From day to day, every day. Without a clear vision for the business, employees have no direction. This is the common thought of employees in a business without a clear vision. Everyone in the organisation knows who the leader is. The leader is present, and appears regularly. The leader is not hiding, and is not distant. In a small dental practice, the leader is willing to do what is needed, if needed. In a large corporation, the leader visits the outlets and visits the employees. In so many corporations there is a disconnect between the shop floor and the head office. You don’t want an ivory tower in your business. This should be your governance. Look at Richard Branson. He’s not invisible. A well-led business has clear and concise systems and processes. These systems and processes cover in detail the procedures and interactions that occur in your business. There is a clear understanding from the employees as to what needs to be done, in a clear and precise step-by-step manner. There are also clear guidelines for interactions between employees and customers, employees and each other, and employees and trade people. Everyone in the business should be able to refer to a document that covers all processes in the business. A well-led business will also have well documented processes as to what to do when something in the business does not quite go to plan. Sadly, the media, and social media are overflowing with stories about things that went wrong in any business they can find, and how poorly employees of those businesses handled those departures from the norm. A great leader trains his team to be able to identify all service defects that can occur in the business. An even greater leader has his team ready to go with perfect service recovery plans when and if there is a service defect in the business. The way a business recovers from a service defect reflects on the leadership in that business. Great leadership empowers its employees to right the wrongs in such a way that the act of recovery is more impressive than if the procedure had been handled correctly in the first place. A great business grows people within the business, so that those people become great. A great leader will develop his team to see team members rise up and emerge as leaders in their own right. Sometimes these team members stay as integral members of the operation, and sometimes they leave your organisation to go on to bigger and better things. A great leader knows that both these results are a win-win. Businesses with great leaders stand head and shoulders above their competitors. Businesses with great leaders naturally attract more customers. It just makes sense to improve your leadership of your business…. This morning a story on Facebook has gone viral, with dire consequences for the business concerned. A woman has taken to Facebook to vent as a result of being humiliated at a hair salon in Western Sydney. Now I can see the salon’s point of view….. The woman, who has never used the salon before, has turned up and had a service but because of a mix-up, has left her purse, with cash and cards, at home. The lady is able to find $15.00 of the $30.00 service fee, but the salon has insisted that she stay put and get someone to bring the remaining $15.00 down to the salon. As the woman tells in the story, she has asked if she can transfer the money [using her phone] into the salon’s account. What was the problem with that for the salon? There’s the problem right there…the salon is not accepting of a reasonable solution. And so the salon has just invested $15.00 in a bad media campaign. Simple fact is that the salon is part of a bigger multi-location organisation, and so the manager is not the owner. And the manager has shown that she’s not the right person to be in charge. Because although she’s probably followed company “policy” to prevent a runner, what she’s ended up doing is purchasing a very irate customer for the business. And I know that the customer has made and created her own mistake. And I know that this business has probably suffered runners in the past. But the customer did offer to leave her bag, and mobile phone as security as she went home to get her purse. But the manager dismissed this as a solution. Sadly, this customer’s predicament, which is really not the salon’s fault, has escalated into the salon’s problem, in the same way that the Seinfeld characters ended up in prison for failing to obey the Good Samaritan Law when it needed to be. The salon manager needed to be on damage alert. I’ve written about this sort of issue before. And you have to know WHEN to let go, and when it’s worth more to let go. That’s what should have happened here. Sadly, the salon has bought itself a whole heap of bad publicity. In this day and age of social media amplification, there’s no winning, even if you are in the right. Which wasn’t the case here…. Really, the manager should have let go….in just the same way that I dropped the rope in my previous blog post. There’s a serious lesson here for all businesses. You really do need to know when to let go, for your own sake. Most Dentists Have Trouble With Addressing This One Behaviour…. It’s funny, but for some reason dentists have difficulty with confrontation. And really, by not doing what I tell them they should say, these dentists are committing themselves to extra misery and despair. And I’m not talking about SELLING. I’m talking about staff issues. I hear of an inordinate number of dentist employers who don’t like the idea of having to resolve conflicts in the Dental Office. And sometimes that conflict is including them, the dentists. Have you ever had a staff member roll their eyes at you? Have you ever had a staff member huff and puff? Because that staff member disagreed with something that you as the dentist owner has said, done or asked? And it shouldn’t be so…. We’ve all watched enough military movies to know that for an army to perform optimally there needs to be a chain of command…. and respect. One of my previous employees was a dental assistant in the Royal Australian Navy. In a dental practice, employees expect their owner to be civil and courteous. But we need to understand, that our owner has invested a lot of time and money into the business, and for that fact, that they are owner, there needs to be respect shown to them. Those without “skin in the game” need to be mindful that they will be asked to do things by those who own the business. And as long as those tasks are not illegal or immoral, then they should be performed when asked for, without an eye roll or a huff, or any other sign of disdain. Sadly, a dentist I know is finding himself on the receiving end of the “attitude” eye rolls from one of his team members, whenever there’s a change of plans in the dental day. And that sort of behaviour from the employee needs to be addressed and eliminated. Because in a small office of sometimes only three or four employees, there can’t be any signs of dissention. Sadly, performing dentistry is one of those “events” where we try to estimate the time needed for certain procedures, but sometimes we end up with unexpected surprises that make our days a little more challenging. This dentist I was talking about was receiving eye rolls from a team member every time one of these challenging moments surfaced. And when the eye roll appeared, this outward display of dissatisfaction from the team member would upset the dentist. And sometimes eat away at the dentist because the dentist disliked confrontation. So what should you do if this happens in your office? Obviously this behaviour needs to be addressed. Because it can eat away and away and away if it is not addressed. My advice is that resolution needs to be found sooner rather than later. Firstly, it is not appropriate to discuss the behaviour in front of the patient. However, as soon as possible is better than a few days later. You can’t discipline a puppy for going to the toilet on your carpet three days after the event. And so you need to speak with the team member as soon as is possible. I like to approach the team member and let them know that there’s something that I need to discuss with them. And organise a time to do so. And whether the team member concedes this behaviour or not, I need to let them know that this behaviour is not appropriate. During my time as a business owner I’ve even seen staff roll their eyes in agreement, towards each other, as a sign of mutual objection about a situation or about a patient. And that’s a behaviour that also needs to be addressed. It wouldn’t be appropriate in the military. Why should it be tolerated in a small business environment?